Dramatic new video footage of two critically endangered Javan rhinos and their calves was released today by WWF-Indonesia and Indonesia’s National Park Authority. The footage, from a motion-activated video camera in Indonesia’s Ujung Kulon National Park, is a huge boost to efforts to save this almost extinct species that is threatened by poaching, disease, and the possibility of a tsunami or volcanic eruption. “The videos are great news for Javan rhinos and prove that they are breeding in Ujung Kulon,” said Dr. Eric Dinerstein, chief scientist at WWF-US. He warned, however, that the survival of the species is still far from certain. “There are no Javan rhinos in captivity—if we lose the population in the wild, we’ve lost them all,” Dinerstein said, pointing out that an eruption by nearby volcano Anak Krakatau could easily wipe out all life on the peninsula where the rhinos are concentrated. 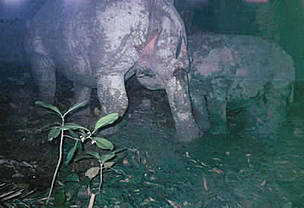 The Javan rhino is possibly the rarest mammal on the planet with as few as 40 left. Once numerous throughout Southeast Asia, its population is now likely isolated to Ujung Kulon National Park in Indonesia. This small population size makes it extremely vulnerable to any threat, including poaching for its horn, which is traditionally believed to have medicinal properties. The video trap, installed by WWF-Indonesia and Ujung Kulon National Park Authority, captured images of the rhinos and their calves between November and December of last year in the dense tropical rainforests of Ujung Kulon National Park on the island of Java. WWF is working with Ujung Kulon National Park authorities, International Rhino Foundation, Indonesia Rhino Foundation, Asian Rhino Project, IUCN/SSC Rhino Specialist Group and local communities to protect this species from poaching, monitor the remaining rhinos, and establish a new population by relocating several individuals. WWF has established an emergency fund to support the establishment of a Javan Rhino Study and Conservation Area into which a handful of rhinos will be moved. Visitors to www.javanrhinohope.org can learn more about the species and donate directly to a fund that will establish the conservation area and monitor the several individual rhinos that will populate it later this year. Establishing a new population is an essential buffer against a potential tsunami and an outbreak of disease and/or poaching. The first video, recorded in November, shows a mother and male calf walking steadily towards the video trap, munching leaves. At one point the calf turns away from the camera and wags its tail to swat a fly. The second family made its video debut in December in a 30-second video that shows a larger female calf, approximately one year old, walking with her mother.